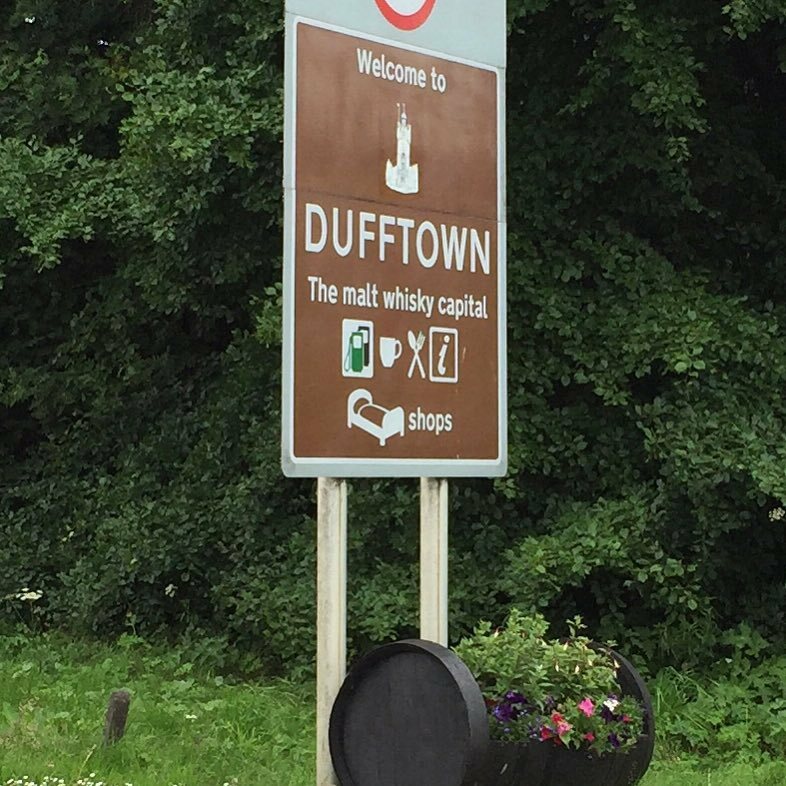 Here’s a question for you: When on a walking trip of Scotland, what does one do when one finds oneself within walking distance of Dufftown, the self-proclaimed “Single Malt Capital of the World”? Elementary, my dear reader! One takes a day off from walking the Speyside Way in order to walk to the fair village of Dufftown for a bit of Whisky tourism. 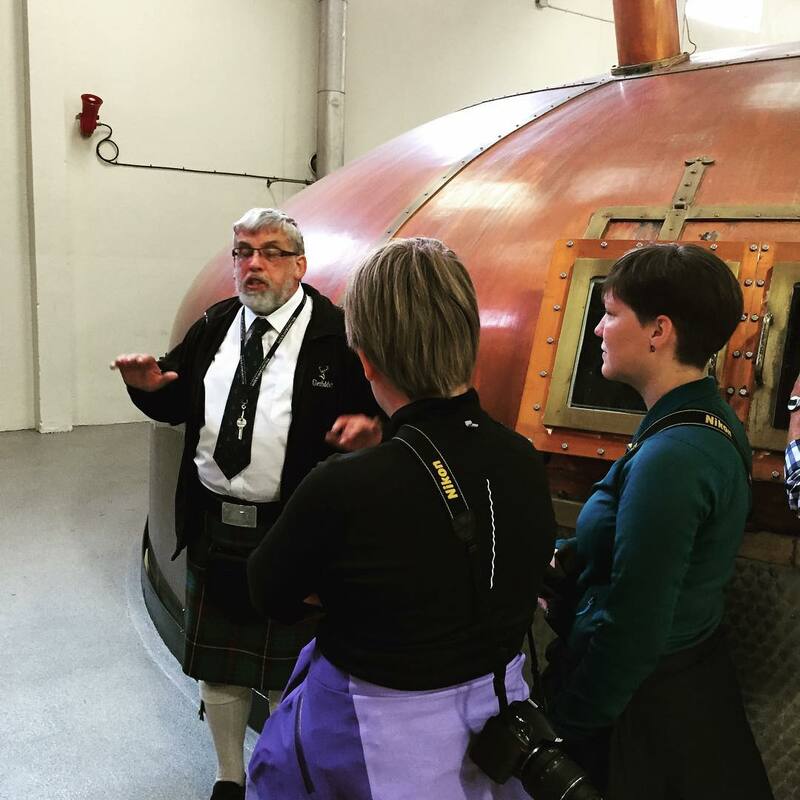 And when in Dufftown, why take the so-called Glenfiddich Distillery Explorers Tour, a popular touring option of the biggest distillery in all of Scotland? You see, my friends if there’s one upside to visiting Scotland (there are, in fact, many), it is that you’re pretty much guaranteed to run into at least a couple of distilleries as you move about the country. And chances are, my friends, that some of those distilleries welcome visitors and by welcoming visitors I mean offer free tours and free drams to tourists! No lies, people, a rule of thumb – at least in the Speyside area – seems to be that if you take the time to visit, they’ll take the time to show you around and offer you a sample. If you are in the mood for more specialized tours or tasting more impressions of the local dram extended tours are available at many distilleries at a premium price, usually ranging from £30 to the obscene! At Glenfiddich, though, the biggest distillery of them all, nothing is free. If you show up looking for a tour and a taste, you’re going to have to produce your wallet and pay up. Their standard tour package, the hour and a half-long Glenfiddich Distillery Explorers Tour, is a mere £10 pounds. 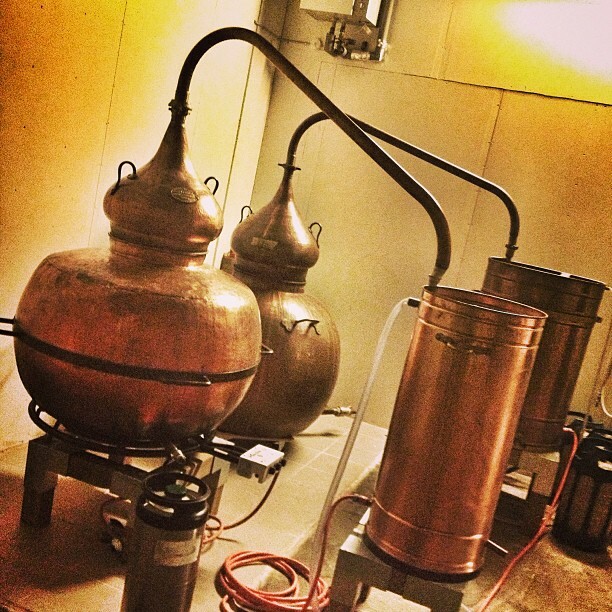 But still, with other distilleries opting not to charge for tours, the question still begged… Is it worth it? To find out, we strayed off our route down the Speyside Way, booked an extra night at our accommodations at Craigellachie’s iconic albeit slightly odd Highlander Inn and ventured off for a short 10 kilometer detour walk through forests and disused railroad tracks to the home of the Glenfiddich distillery, the village of Dufftown. On our way to Dufftown: Ah, the dangerous life of a food blogger! They take their whisky pretty seriously in Dufftown. And they take their job and reputation pretty seriously, they do… Well, to a large extend at least! As could probably be deducted and as we certainly established when entering town and walking past the once busy Dufftown Station which now only springs to life as the seasonal and ceremonious terminating station of the Whisky Line railway, Dufftown is a bit of a gimmicky place. How could they not be with some of the biggest Scottish whisky producers paying their taxes there? 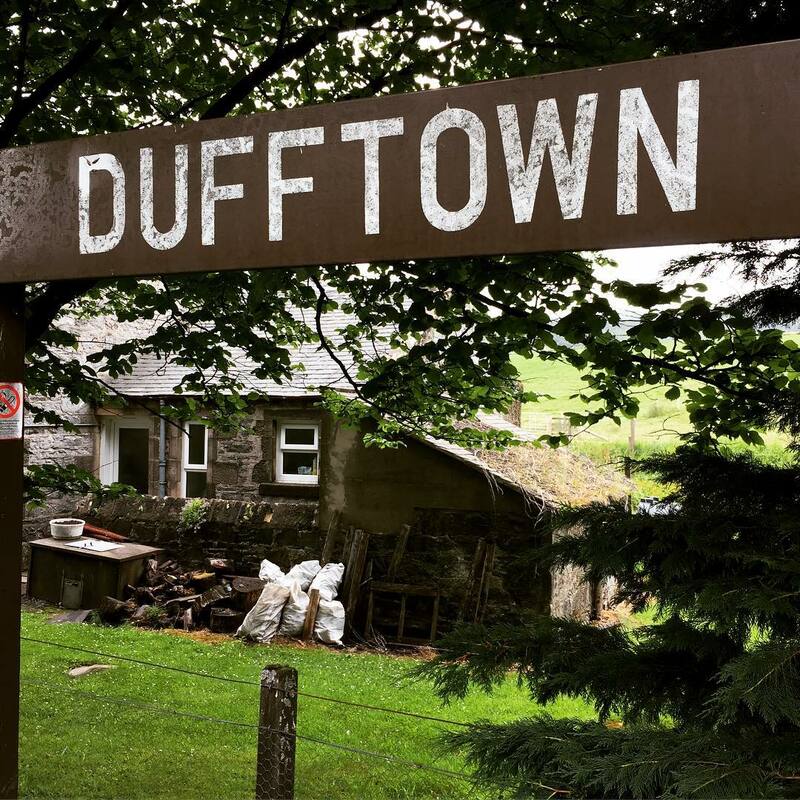 But even so, as you walk further into town, passing ancient warehouses, smelling the malting and brewing process in the air and see people zooming about hard at work, you still get the feeling that Dufftown is first and foremost very much a working place. While tourism is visibly booming and the visitor centers, pubs, hotels and restaurants plentiful, you get a feeling that the production is top priority with tourism a close second and quaint village life a close third. The feeling is only intensified as you wander onwards into the village’s ancient main square and have a look at the shops, people and pubs… But that’s another post, for now our story takes a hard left turn from the main road towards our destination. Welcome weary travelers, she seems to say! At the heart of Dufftown is the gigantic operation that is William Grant and Son and in the heart of hearts lie Glenfiddich, the largest distillery by volume in Speyside – in all of Scotland, actually. Glenfiddich (Valley of the Deer) was founded in 1866 by William Grant who, along with his sons, and other tough as nail helpers, built the original structures (many of which still stand today) by hand in order to produce what they believed would be the best whisky in the world. The first spirit flowed from the stills on Christmas day of 1867 and now, after more than a century of hard work, craftsmanship and incredibly wise (or danggone lucky) strategical decisions by five generations of the Grant family, Glenfiddich stands the largest and most famous distillery in Scotland. So, you’d think they’d be able to afford treating us to a tour, right? I mean, especially with a famous food personality such as myself sporting the loveliest of company? Ahem, I digress. The fact is they probably could, but for reasons that would soon be apparent, they wouldn’t. And from conclusions soon to be made, that was pretty okay, actually! Beware of Low season: Every year, for a few weeks, the entire production process of all distilleries are shut down for a few weeks due to maintenance and cleaning. A thorough summer cleaning if you will. According to our friendly guide at The Glenlivet Distillery this is done in the summer because if done in cold weather, parts of the production pipeline usually heated by the warm mash might actually freeze. When we visited Glenfiddich, they were just coming back into production, meaning that the heart of operations – The Still House with its iconic “small” copper stills – was still off limits due to maintenance. Most distilleries, it seems, will offer tours for at least part of the low season, but tours might seem a little less lively or certain areas may be off limits. If the distillery is not shut down entirely. That is. So here’s a piece of advice from your friendly neighborhood food blogger: check with the distillery before going during the summer to see if they’re in low season and what that might mean as far as tours are concerned. Their website is a good place to start. Our tour began as so many things in Scotland, at a check-in counter manned by a couple of young, not unattractive ladies who were entirely too busy chatting amongst themselves to properly welcome us and take note of our reservations (reservations for the standard Explorers Tour are encouraged but not required, all other tours are by appointment only). When, eventually, we were acknowledged, we were greeted with warmth, welcomed and told to wait in the visitor’s center lobby for a few minutes until the tour picked up. We did so, happily, spending what little wait we had, checking out the Grant Family tree and the Glenfiddich history highlights plastered on the walls. A few minutes down the line, we were greeted by a proper tour guide who led the entire congregation (some 10-15 of us had gathered) into an adjacent movie theatre for a short film detailing the birth and rise to fame of the Glenfiddich Single Malt Whisky. The movie reel while theatrical, bombastic, full of storytelling and, evil voices would argue, maybe a little over the top as a beginning of a tour of a family business actually did not make the story of five generations of the Grant family turning a hand-built distillery into a world class distillery any less impressive. Following the movie, we were a little surprised to see our lager group split between a host of three or four official guides. The idea here apparently being not only to make the experience more friendly and intimate, but also to accommodate the various nationalities visiting. French guests were matched with a French speaking guide, the Germans with a German speaking ditto and the Danes, Americans and Italians were stuck with a warm, middle aged, Scottish speaking gentleman who happened to also be able to converse in Italian and throw forth a few words in various Scandinavian languages. Our new friend of the day – or the next couple of hours at least – welcomed us heartedly and started, in a perfectly lengthy manner (that is neither too superficially nor to lengthy), guiding us through the massive operation that is creating the Glenfiddich single malt. We started our trip at the site where the some 100 metric tons(!) of malted barley used per day made its way into the pipeline. We were then walked past the unreasonably large copper kettles where the barley was boiled with local spring water to produce a mash that was subsequently transported to large cooling tanks and cooled before being led on to one of many equally impossibly large fermentation tanks where a bit of yeast joined the party. Within a few days, we were informed, the yeast helped create what was essentially a rather strong, but apparently not very nice tasting, beer. 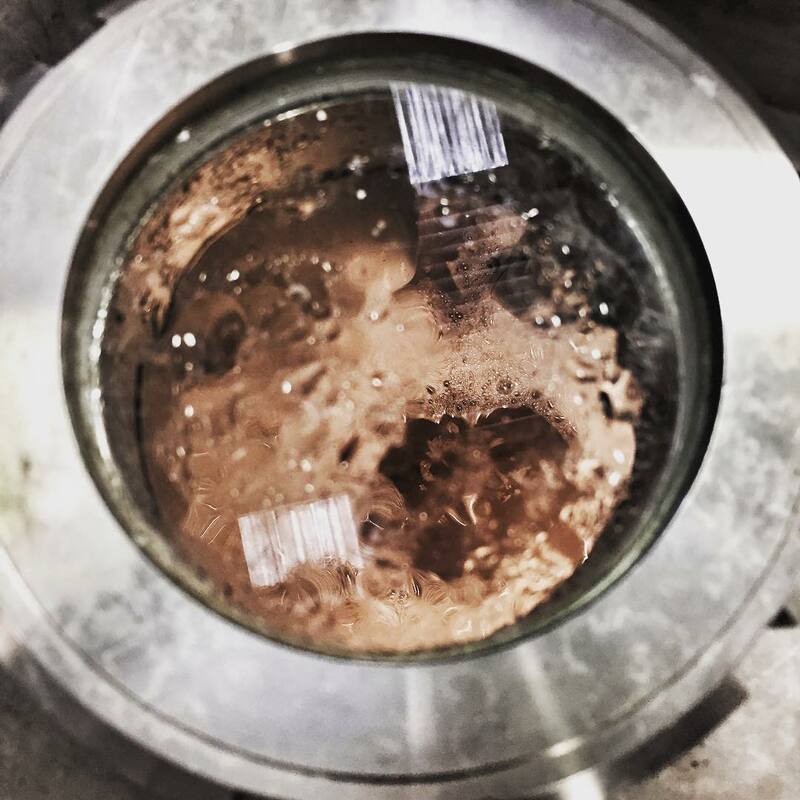 This liquid, in whisky terminology called wort, was funnelled on to a number of, we were told, unusually small copper stills for distillation. They may well have been small by Scottish standards, but I’ve seen unreasonably small copper stills at my buddy’s distillery here in Kolding and I’m pretty sure those were slightly smaller than the ones we saw at Glenfiddich. Or didn’t see, really, as the stills were sadly off limits to visitors due to maintenance work. But I digress. Whisky River Take My Mind! What we did get to see instead was our kilt-wearing Scottish guide gesturing around outside the stillhouse, offering a rather nice explanation of the distillation process which basically involves boiling the wort to fortify it, collecting the best, most perfectly alcoholic and pure parts of the resulting liquid – known as the heart of the spirit – and passing them on down the line to the most exciting part of the process – the cask ageing process during which spirit actually becomes whisky. The unusually small copper stills at my buddy’s distillery… From afar, those at Glenfiddich looked a tad less unusually small. But still pretty small. And this, my friends, is where you’ll have to use your imagination to an even larger extend as the most memorable part of the tour is actually the part I can’t show you. 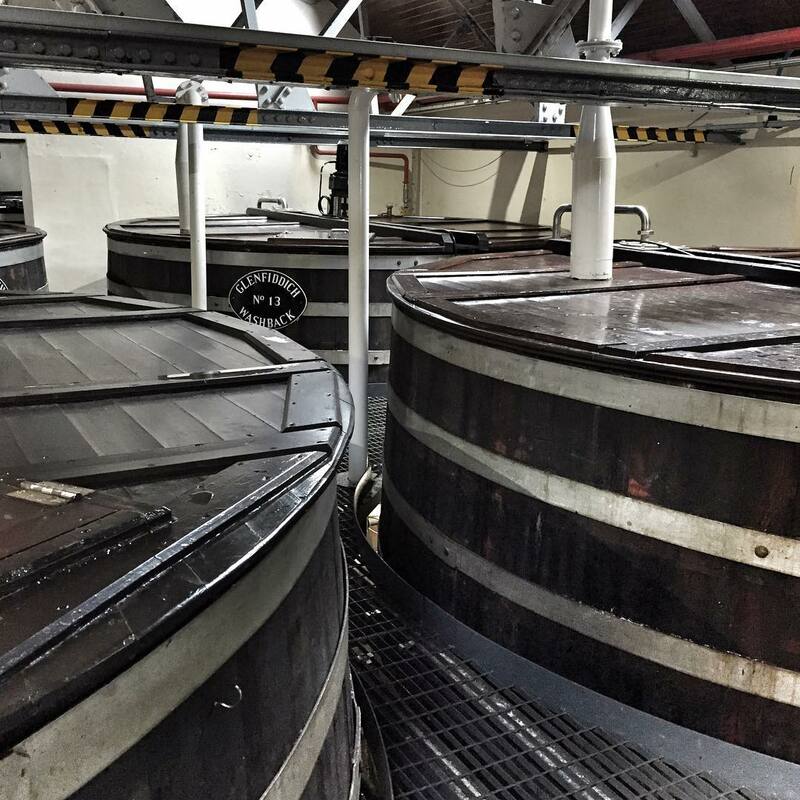 And that is the tour of the warehouses where casks upon casks of whisky of varying ages lay ageing, giving off a wonderful aroma of evaporating alcohol for visitors and the angels alike to enjoy. For reasons that were officially explained to us not as secrecy but rather an extreme danger of explosions (ahem! ), photography in the warehouses was strictly prohibited. But nevertheless the visit offered an unforgettable overview into the whisky ageing process including how whisky barrels are made, procured and maintained, how whisky draws flavors and character from the barrels and why different kinds of barrels matter. We even got to see and in some cases even open and smell some truly incredibly old and rare casks as we tried to smell the difference between 40+ year old ex-sherry casks and 40+ year old ex-bourbon casks in a fun little activity that helped us understand just how hard the job of a master whisky blender can be when he has to eventually select casks for bottling. Blending?! Single malt whisky, a definition: Maybe you’re a bit confused hearing the word blended in relation to a Single Malt Whisky. Maybe you thought blending was a term reserved for Blended Whiskies. Well, I can’t say I blame you, but here’s the quick low down. The term Single Malt whisky simply means that a Whisky is produced by a single distillery, it seldom means that the whisky is produced from a single run of distillation or a single whisky cask (such whiskies are called single casks and are entirely different and ridiculously expensive creatures, indeed). To produce a single malt whisky, a master blender will usually select several casks of whisky of various ages and blend them together to create a final product such as the Glenfiddich 12 year old. The age statement on the bottle, by law, refers to the youngest cask used in the final blend. Some components of a Glenfiddich 12 year old may be considerably older than the 12 year age statement. A Blended Whisky, in contrast, is a whisky produced by blending various casks from various distilleries. No two whisky casks are ever quite the same, you see, but a bottle of Glenfiddich has to taste the same everywhere in the world, so quite a lot of sniffing and selection obviously goes into creating each batch as several different casks from different years and/or warehouses are combined to create the final product. I’m telling you, getting to pace the wooden floors of Glenfiddich’s original Warehouse No. 1, built by hand more than a century ago, checking out the casks and smelling the wonderful aromas of decades worth of whisky slowly maturing is quite an awe-inspiring experience and one I’ll keep with me for years to come even if I won’t have the pictures to remind me. The legendary Warehouse No. 1. at Glenfiddich. No pictures beyond this point, sorry! Having in such a way gained a fair bit of appreciation for the amount of work, time and skill that goes into creating a single malt whisky, we ventured on back into the light, across a court yard and into a separate room to what is probably everybody’s favorite part of a distillery tour: the tasting of the final product! 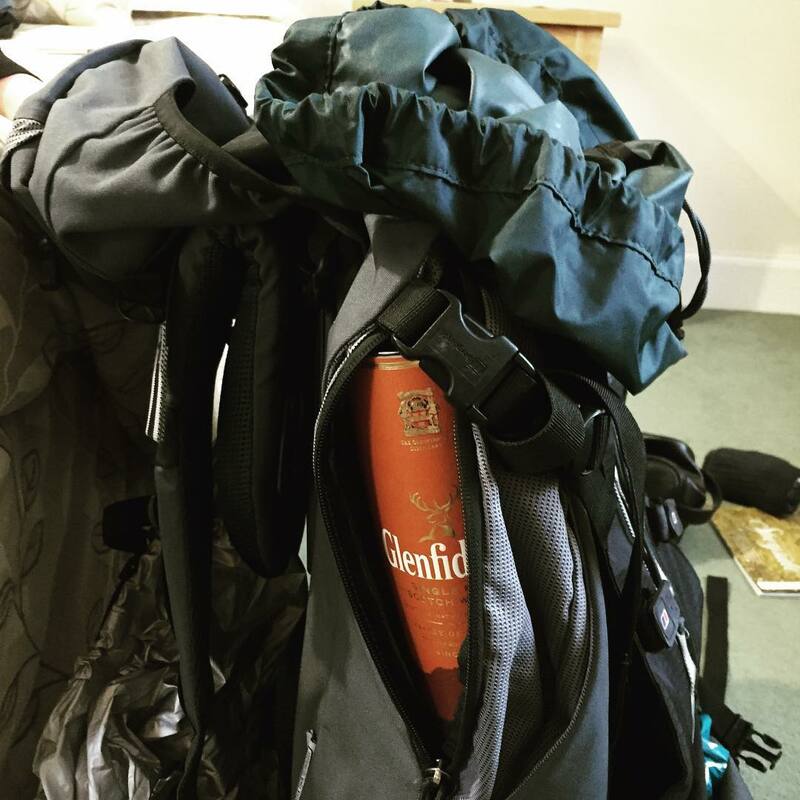 And here, my friends, we discover once and for all why there is no freebie tour at Glenfiddich. You see, aside from a lengthy in-depth tour of the production process, even the standard tour at Glenfiddich encompasses not one dram, but an entire flight of whiskies for each visitor to taste. 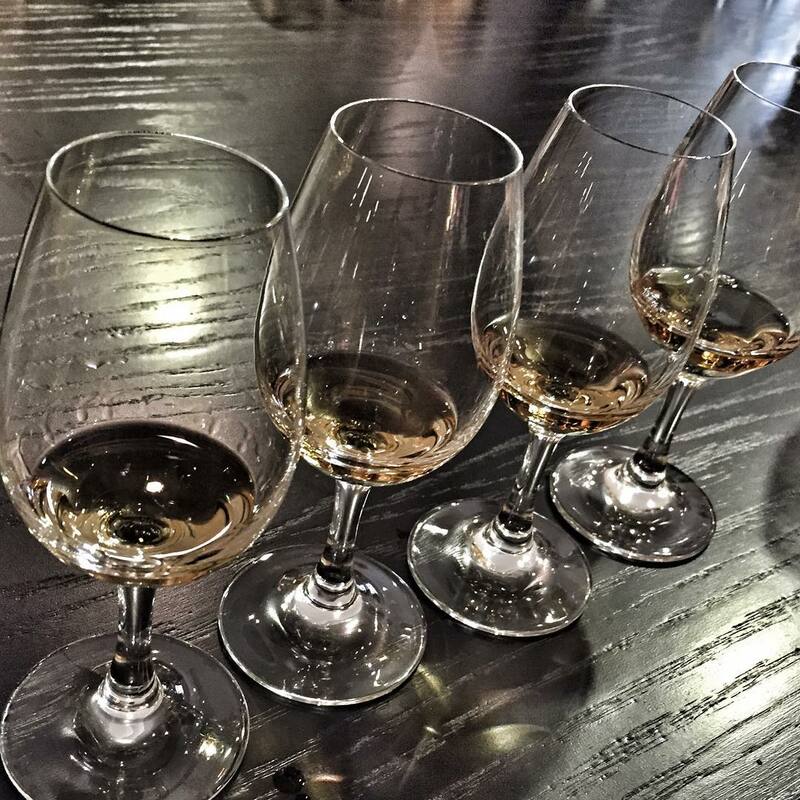 Four specific impressions of Glenfiddich to be precise, proudly poured and introduced by our knowledgable guide. This rather informal and happy ending to the tour allowed new friends of Glenfiddich to get to grips with the basic lineup while allowing old friends, such as myself, a rather unique opportunity to taste some familiar whiskies side by side and compare both subtle and less subtle nuances and differences, all while taking a few mental notes for the blog and looking like we knew what the hell we were doing. Glenfiddich 12 year old: The 12 year old is the signature dram from Glenfiddich and an easily likeable one at that. Full of straight up pear flavors, sweetness and a nice subdued warmth with little to no burn, it’s very much an entry level Whisky in the most positive sense of the word. It’s where I started my journey into Scottish Single Malts and where I imagine many would feel comfortable starting theirs. Glenfiddich 14 year old, Rich Oak: Here’s an interesting new member of the family, I’d never heard of! The 14 year old, as you might imagine, is a slightly more mature, slightly more complex version of the 12 year old standard dram. After blending the various casks of whisky that eventually make the 14 year old, this version spends some time in a mix of new American and new Spanish oak “marrying” casks which impart some quite wonderful spicy, fruity, toasty aromas as well as a fair bit of vanilla on the final mix. If you’re a fan of oak, be it in your wine or your liquor, this may well be for you. For me, this was the perfect mix between Speyside fruity sweetness and boldness which probably explains why I chose to purchase and carry a full bottle of the stuff with me for the remainder of the trip. 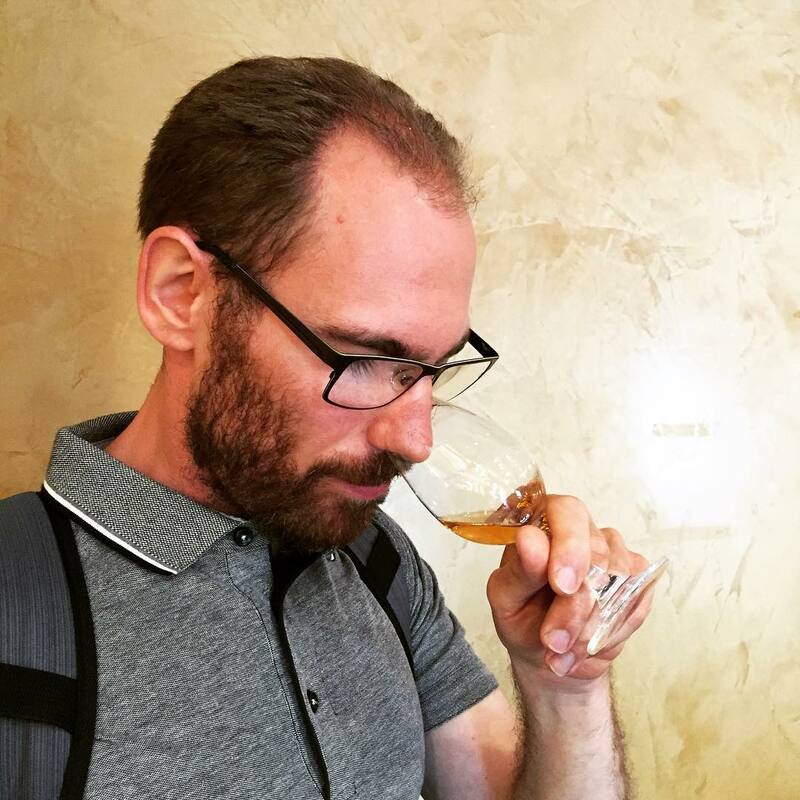 Glenfiddich 15 year old Solera: In terms of complexity, the 15 year old Solera may be the best Glenfiddich has to offer in the reasonably priced segment. The process of creating the Glenfiddich 15 year old, it was explained to us behind closed doors in a none photography zone, is based on the Spanish Solera method and is, for lack of a better word, impossibly complicated. It basically consists of blending a large variety of casks, each at least 15 years of age and leaving them to age together for quite an amount of time in a gigantic Solera cask to create the finished expression. And some impression it is! Glenfiddich 15 is the favorite of many because while not a huge jump in price from the 12 year old, it’s a huge jump in complexity, fruitiness and, well, bam! Fruit flavors are considerably more pronounced and intensified in a dried fruit kind of way, coupled with an oaky roundness and a spicy bite to the tune of ginger and cayenne pepper. Glenfiddich 18 year old: Because a lot of whisky is actually lost to evaporation during the ageing process, drinking whisky with a fair bit of age (15+ years) can be a pretty expensive hobby. Which is why I was a little (happily) surprised to see Glenfiddich 18 at an entry level tasting. All other things being equal, though, Glenfiddich 18 year old is a pretty tremendous effort into smoothness and age. The fruit in this one takes on more of a candied note and the spice note that was evident in the 15 year old as a pungent gingery bite has turned into a more soothing warmth and earthiness. It’s a beautiful effort, no doubt, but (strangely enough) as I’ve aged myself, I’ve apparently started somehow appreciating the bite and character of the younger versions more. While deliciously smooth and well-made, I found more joy in the younger, more pungent brothers. Which is probably good news for my wallet! For the time being, though, I settled for a bottle of Glenfiddich 14 Year Old Rich Oak while the girls both got a miniature tasting set to share with their immediate family, an idea that eventually after having carried my bottle with me the next 100 kilometers suddenly made an odd sort of sense to me. So, I’ve just recently been made aware of what the side pockets of backpacks are really for. If you’re visiting Glenfiddich around lunch time, and with tours going out from around 9 AM to 2 PM, chances are that you may be feeling a bit peckish after the walking and your whisky-tasting experience. If you are, you’re in luck because Glenfiddich has their own on-site lunch restaurant, cleverly named The Malt Barn. Set in a high-ceilinged building that may or may not be a converted barn, the restaurant serves up hearty Scottish classics as well as a few continental options. All made using fresh ingredients and speedily cooked to order. 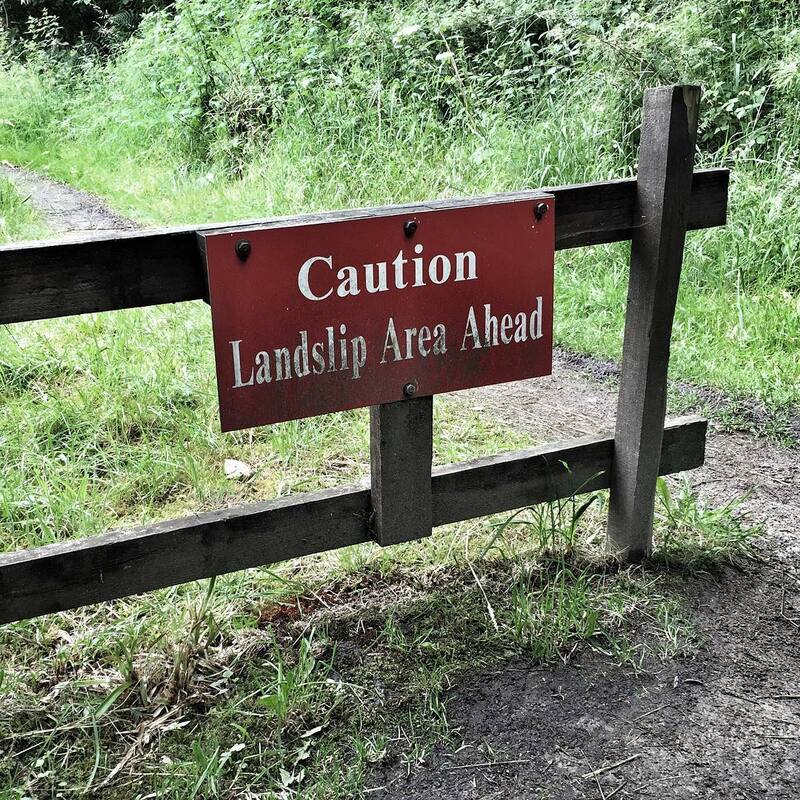 While fresh and genuinely attractive – even in the case of my haggis, neeps and tatties – I should warn you that the portions are on a bit of a small side for those who, like us, are crazy enough to make the trek on foot. It should be noted, though, that most other visitors seemed sane enough to arrive either by car, bus or train and had no issues. But I digress… Should you find yourself hungry at Glenfiddich for whatever reason, a trip to The Malt Barn for a light lunch is certainly worth it for the full experience and for the fact that they incorporate their whiskies (smart, obvious move, that!) into quite a few of their dishes, the Glenfiddich sauce for my haggis being but one example. Furthermore, they also offer well thought out Whisky pairings for each dish on the menu as well as a nice selection of beers and not quite standard soft drinks. Eating lunch at The Malt Barn: Haggis, Innis & Gun and Glenfiddich Rich Oak. 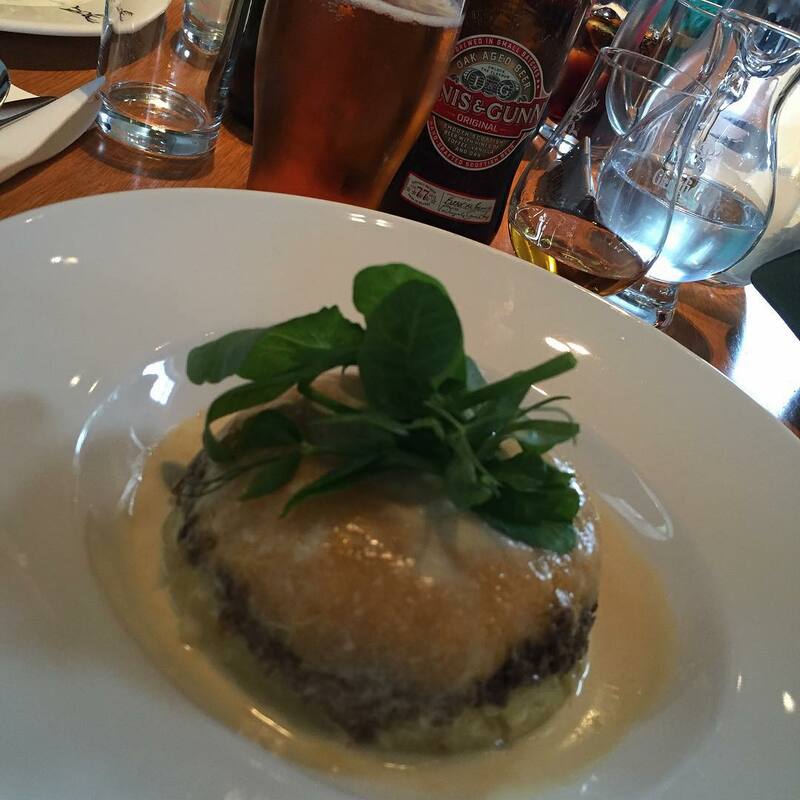 If unlike this humble food blogger, you’re not content with a plate of haggis, a beer and a dram of Glenfiddich Rich Oak to go along, there’s also a rather extensive whisky menu to gaze at or a whisky bar to kick back at after your meal. The drams on offer feature (quite naturally) the world’s largest bar selection of Glenfiddich as well as some guest players from sister distilleries. Whisky options range from affordable, common varieties to rare, obscure and insanely expensive bottlings, including a nineteen-fifty-something bottle of Glenfiddich poured at around £1000 per 2 cl sip – mostly to wealthy Norwegians, I’m told. Pro tip for the ladies! Ladies, you obviously did not hear this from me. At least not directly. But if you happen to be at the Glenfiddich distillery. And you happen to be visiting the Malt Barn, or just passing by, do yourself a favor and check out the ladies room for a surprise you won’t soon forget. Just saying. And once again, you didn’t hear this from me. Exploration of the Whisky menu would sadly have to wait for some other visit, though, as we had places to be and miles to walk. 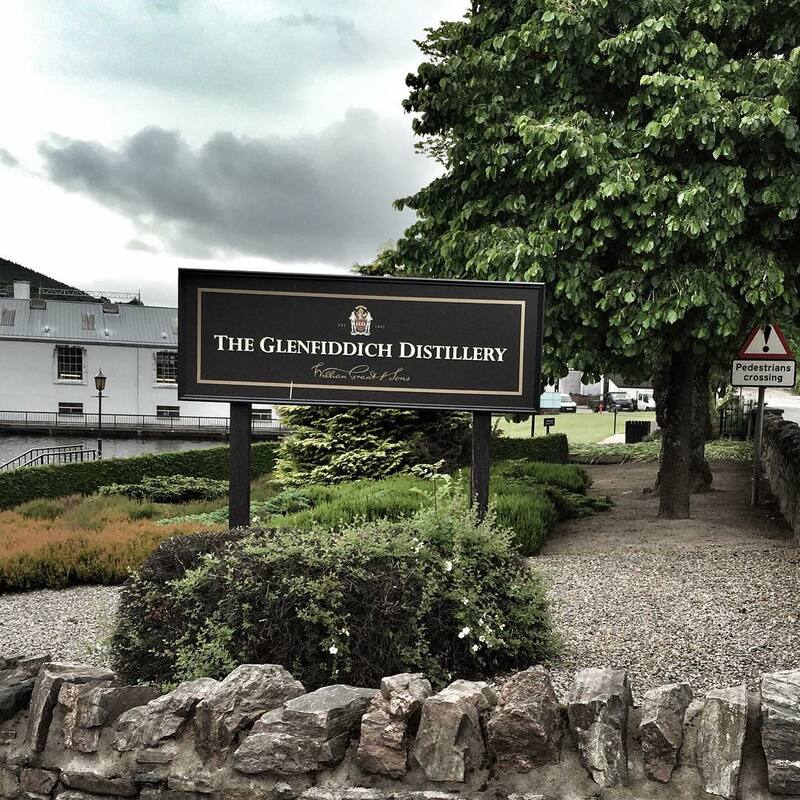 And so, with our bellies full and our legs slightly wobbly from a pre-lunch whisky tasting, we left the hallowed grounds of the Glenfidich distillery and trekked the ten odd kilometers back a disused railroad track to our accommodations in Craigellachie. A trek that left me plenty of time to ponder the question that entered my mind at the beginning of this account: charging for something that is essentially free in other places? Is it fair? Especially when you’re the biggest player on the team? The answer I came up with, should you not have guessed by now, is a resounding yes! Had we been talking a museum or gallery, I’d have been well pleased to spend £10 on a tour so comprehensive, engaging, interesting and humorous as the one we received. Add to that a lengthy yet down to earth introduction to whisky and the production process as well as a more than generous sampling of the resulting product. And, well, you’re staring at a right bargain even if you are in some strange way essentially paying to be part of the Glenfiddich marketing apparatus. That’s me speaking as a whisky fan, of course, but despite not being a major fan of putting words in people’s mouths, I’d dare venture the guess that the girls felt the same. 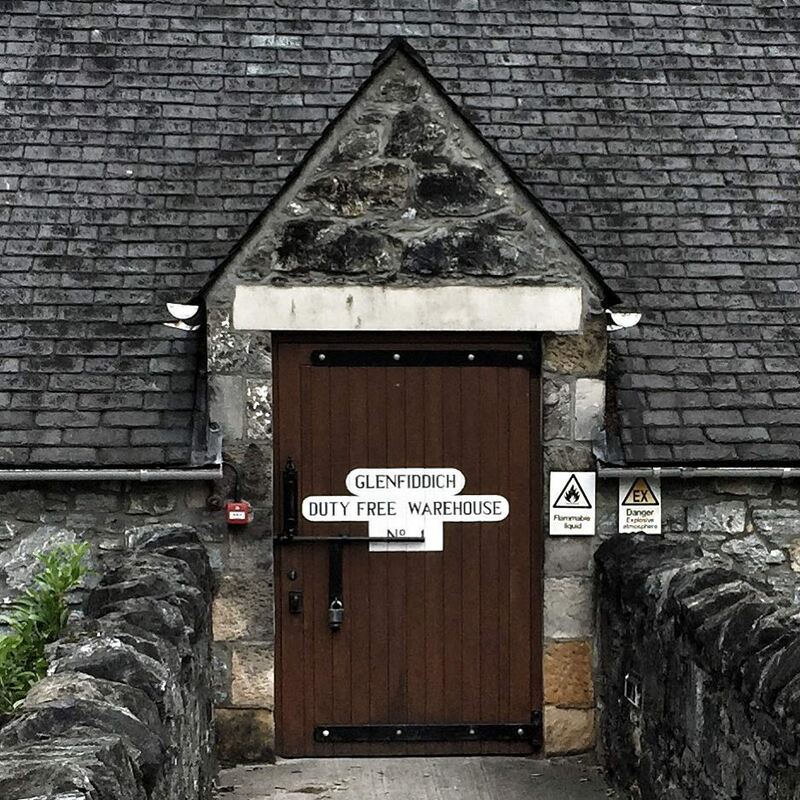 If you happen to find yourself in the Speyside area of Scotland, I’d highly recommend taking a few hours off for the Glenfiddich Distillery Explorers Tour, it’s well worth the time and money! Heck, in all honesty, I don’t think you could get four drams of Glenfiddich in a bar for the same amount of money, and you’ll feel eternally more smart and sophisticated after doing the tour than you would pounding four shots at the bar. This entry was posted in Restaurant Reviews, Wine & Drink and tagged decadence, review, spirits.